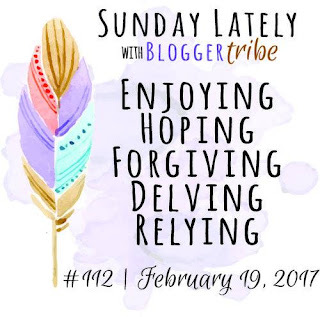 Sunday Lately is a weekly linkup hosted by the Blogger Tribe. We e-hangout every Sunday, sharing a small glimpse into the past week of life in our own worlds. ENJOYING... my weekend away with Dan! His birthday was Friday, so we took a little road trip to Chattanooga. We got a great Airbnb on the Southside, walkable to lots of things, and today we took in the Tennessee Aquarium. His birthday wishes were craft beer and aquarium, so it was a success! I'll do a post recap soon with all of the details. Chattanooga is an awesome, under-appreciated city, at least in the eyes of this Tennessee non-native. HOPING... for warmer weather! Please? I am tired of the dance in between cold and warm. Until there are more flowers outside, I'm enjoying flowers that I have inside, including some I got for Valentine's Day from my parents! FORGIVING... my food trespasses. I'll start tracking points again on Thursday. It was a crazy week, and I just needed to let go. Carbs, forgiven. Sometimes we just need to take a step backwards and not make ourselves miserable with shame about it. DELVING... into DAR awards and our taxes. Yikes, so much paper! Must. Start. Digging. Blergh. At least I've got it all sorted into folders? RELYING... on the little things in life for a chuckle! Like my silly cat trying to get me to pet him more. The world is so bizarre and tense right now. I need fur baby snuggles. On the Blog: I had some seriously delicious adventures in San Antonio early this week, and somehow I managed to blog about them pretty soon after I got home! On Twitter: These pictures of people making googly eyes at Justin Trudeau, and then these of Trudeau making googly eyes at President Obama are basically the cutest ever. On Pinterest: I enjoyed my most recent Stitch Fix so much that I requested to get another one sooner than scheduled. I've been pinning lots of tops to my Pinterest board for my stylist! On Instagram: The most INSANE ceviche ever. Must-see. Shopping: This magnetic air vent cell phone holder thingy from Wizgear is the bomb. I used to have this holder that you clipped into, but it was a pain. I saw my coworker had this one, and now we're ordering more so Dan can have one too. It even works with his Otterbox case! No clips, it just sticks up there, and you can change from horizontal to vertical in a snap. Drive safe!